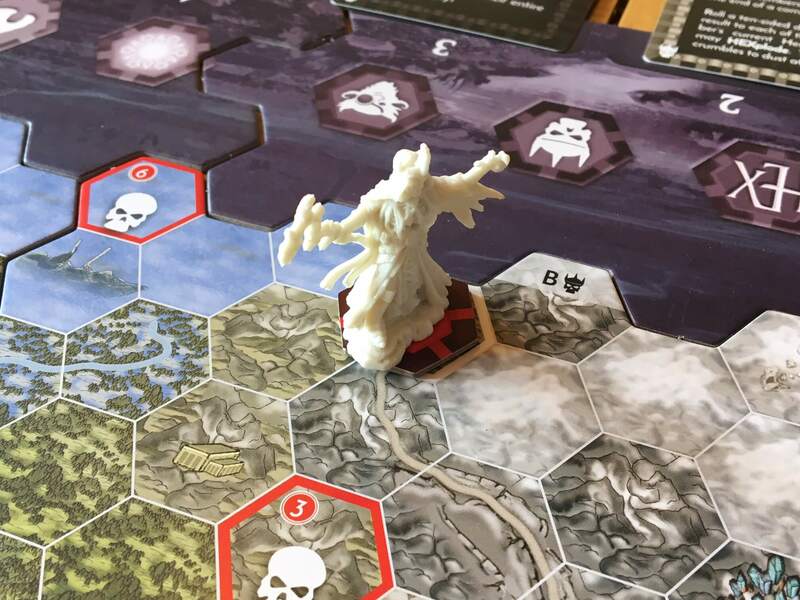 HEXplore It: The Valley of the Dead King review – Step forth adventurer! As a (young) child of the eighties, I missed the peak of the Dungeons & Dragons style of tabletop gaming by about five or maybe ten years, but even so, adverts on TV and in magazines (not to mention the popular children’s cartoon) gave me an insight into the kind of adventures that older kids all over the world were having. Imaginative as I was and with time on my hands, I remember pinching A3 sheets of graph paper from my dad and drawing out hex and square based maps complete with forests, streams and treacherous mountains. I can’t help but wonder if HEXplore It designer Jonathan Mariucci and his team were kindred spirits of mine, because this superb “hero crafting” game is literally my childhood dream come true. Clearly, the HEXplore It team has built a game that is far more accomplished than my childish scribbling could ever have been, but even so, what strikes me most about this game is how it is both incredibly straightforward and yet so powerful. It is literally an RPG toolkit that can be played by anyone, anywhere, in perhaps as little as two hours. Boiling it down to the simplest level possible, HEXplore It is a single, highly variable choose your own adventure that is built around the titular Valley of the Dead King. In every game (without fail) the Dead King himself will appear in order to wreak havoc across the map and place pressure on the players by sacking cities and so on. What makes HEXplore It truly exciting is the combination of heroes that will face him and the adventures that they experience along the way, each of which are highly, highly, highly variable. 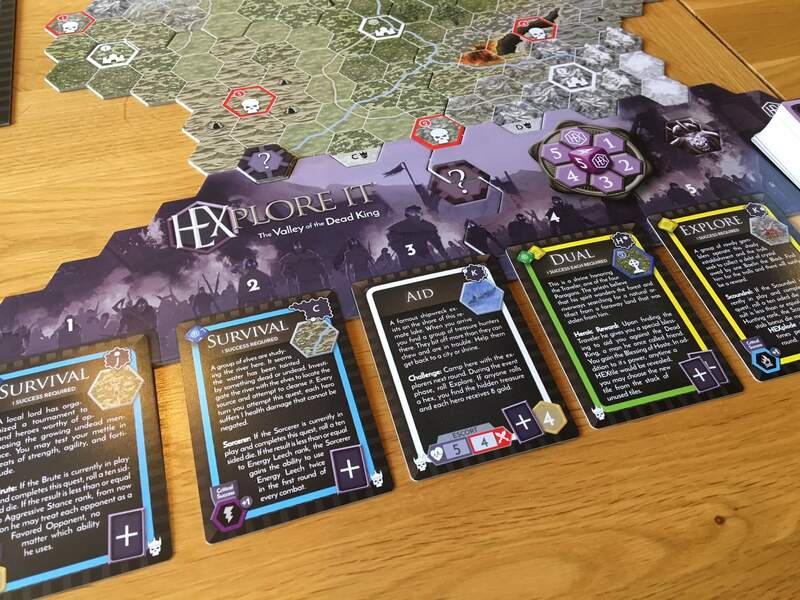 The game play experience of HEXplore It is largely driven by a couple of decks of cards known as Quests and Circumstances. Each turn, a Circumstance will usually have to be faced based on the roll of a dice, whilst Quests are persistent events that almost always relate to the specific map tiles – some of which may not yet have been discovered. Many Quests confer powerful permanent benefits to their hero(es) upon completion, so the players will usually need to bag a few of them before facing The Dead King. The longer he is left unfettered however, the more powerful he becomes – and the closer the game draws to it’s conclusion. On the note of hero creation, HEXplore It does it better than perhaps any other game that I’ve played, maybe ever. Each player chooses one (or more) heroes by combining a large class board and a smaller race card. As you can see in my example below, I chose two characters randomly and ended up with a Gremlin Illusionist and a Fallen One Cartographer. The race cards confer various benefits that are literally written onto the wipe clean class board, resulting in what you see below. Every bonus on the race card is clearly colour coded to match a hex on the class card, which makes this process incredibly simple. Once this is done, each hero is given some money and is able to purchase items, food and stat upgrades, at which point you’ll probably want to appraise how best to use your character. My Gremlin Illusionist, for example, was quite good at avoiding powerful, single target attacks whilst offensively, she had access to a racial skill that made her more deadly and a skill that allowed her to buff an ally. I felt like her race and class were well matched from a flavour perspective and I had great fun making up a story about how she lived among humans thanks to her ability to change her appearance. My Fallen One Cartographer, on the other hand, was even more interesting. As a former servant of The Dead King, he was an undead wanderer who was compelled to walk the earth by a relentless, inhuman need for vengeance. Perhaps he was raised by a friendly necromancer and programmed that way, or maybe his conversion by The Dead King was interrupted somehow? Either way, it was a fun challenge to match his race with the role of a Cartographer and it felt rewarding to do so. Whilst the mechanical aspect of building characters in HEXplore It is very smooth and superbly done, the light role playing associated with hero creation is perhaps where the real fun lies. Even if you have a player that feels uncomfortable sharing a creative idea, there’s no pressure – the combination of race and class often speaks for itself. Structurally, players will then explore the map (often expanding it by moving to the edge) in order to complete quests, defeating bosses and overcoming circumstances before ultimately challenging The Dead King. In the meantime, he will join the game sometime in about the first two to four turns (based on a dice roll) and will immediately sack a city. He’ll then move from one city to another (growing faster with each sacked city) until he has sacked them all, at which point he will force a final showdown. This mechanic does a couple of things – firstly in game it creates impetus, whilst secondly, it kind of limits the amount of time that the game can last. There are a few things that the players can do to affect The Dead King’s progress, but broadly speaking there’s a sense of inevitability to his progress. In all honesty, the bar for modern board game production is getting incredibly high these days. With games like Feudum becoming the norm, I can’t imagine how challenging it must be for design teams to ensure that their own theme comes through whilst still ensuring an overall aesthetic that stands up to the competition. You might think that this is a lead in to me letting you down gently about the components in HEXplore It, but in fact, this is another game that is made to a simply exceptional standard in every possible way – it may actually be the most finely produced game that I currently own. Now, that’s a big claim, but let me explain. Everything from the box insert to the number of pens included in HEXplore It is carefully designed to capitalise on both simplicity and efficiency, without ever compromising on depth or quality. This results in a relatively modest box that weighs an absolute ton, but in the six or seven times that I’ve had the game out, packing it away was never once even remotely difficult. The box has several boxes for cards in it, then it has a number of moulded plastic inserts. Each of this has obvious inset spaces for pieces of the board, pens or dice, for example and the whole thing just feels incredibly well organised. I do appreciate that box inserts are not that interesting, but where HEXplore It is concerned, their inclusion says a lot about the overall attention to detail that flows into every aspect of the game. I can’t remember how many race and class cards come in the box, but the number of both is massive, which results in very nearly unlimited variability. The game is so straightforward however that taking the pieces out, setting up the game and choosing who (or what) to play as is an absolute doddle. Games like this are usually daunting, but HEXplore It is not even remotely intimidating and instead it welcomes you with a warm embrace that makes you want to dive straight in. The component quality goes without saying. Every class board is big, robust and clear, with a design that is functional first and foremost, but by no means unattractive either. There are similar cards for enemy bosses (including The Dead King) and everything else just fits perfectly. Consequence and Quest cards are just flavoursome enough to enhance the experience without being fluffy, whilst the board has enough detail on it to make the game feel like a journey through a hostile land. 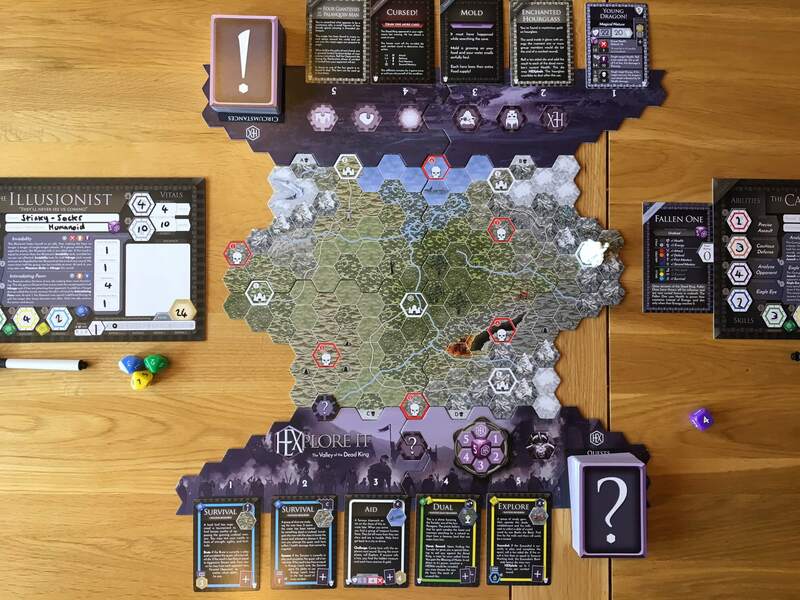 I also like how the design works to put just enough interesting things on the board at once – token management is minimal and whilst there can be turns where the party will just move (and not reach a point of interest) the exploring, survival and consequences phases of the turn (that I’ll talk about later) ensure that the game is always interesting. The simplicity of HEXplore It is never more apparent than in how it plays, which is of course where it counts most. The first phase of each turn is movement, which can be cautious, normal, reckless or not at all (when camping.) The whole party must move together and if cautious movement is used, the party will move slower but cannot get lost and may be able to avoid negative Circumstance cards later in the turn. If moving normally or recklessly, then the party runs a much higher risk of wandering, which often results in a wasted turn, but can be worthwhile when travelling very long distances. Next, each hero rolls against her Navigate, Explore and Survival skills. Navigating is skipped when moving cautiously, whilst at normal or reckless speed, half (or more) of the party must succeed, or else wandering occurs, resulting in movement in a random direction. Each hero that succeeds at exploring meanwhile, will gain two gold, whilst a critical success results in a health boost. Finally, each player scavenges for food – a success means that she won’t need to use up her own food this turn, whereas a failure means that she will. Failure to eat (either way) can result in starvation, so keeping a stash of food is important. Some characters like my Fallen One Cartographer don’t need to eat, which is certainly one less thing to worry about. Next, players will either resolve a location specific Consequence/Event (in a city, at a ruins, on a boss space etc) or more often, they’ll roll one of the face up Consequence cards along the top of the board. This is determined with the roll of a D6, with 1-5 representing numbered cards and the hex symbol (which replaces the 6) denoting the face down card on the top of the deck. Many Consequence cards can be ignored by cautious movement, which represents “sneaking past enemies” or “carefully moving through hazardous terrain.” Some Consequences (such as Moldy Food) are unavoidable. It’s not all doom and gloom though, because many of the Circumstance cards result in treasure or other benefits, so this can be a relatively exciting phase of the turn. Finally, The Dead King is activated and will move towards his next target city. If he passes close enough to the player party, he may deviate in an attempt to initiate the final battle, so unless you intend to fight him, it’s well worth steering clear. Once he reaches a city, it will fall and be replaced by a token. Tokens can be removed (and cities reclaimed) as the result of a relatively complex procedure involving a Talisman item and a battle with a sub-boss. This is a good way to buy time and force The Dead King to go back around the loop again, but it’s not strictly something you’ll do in every game. 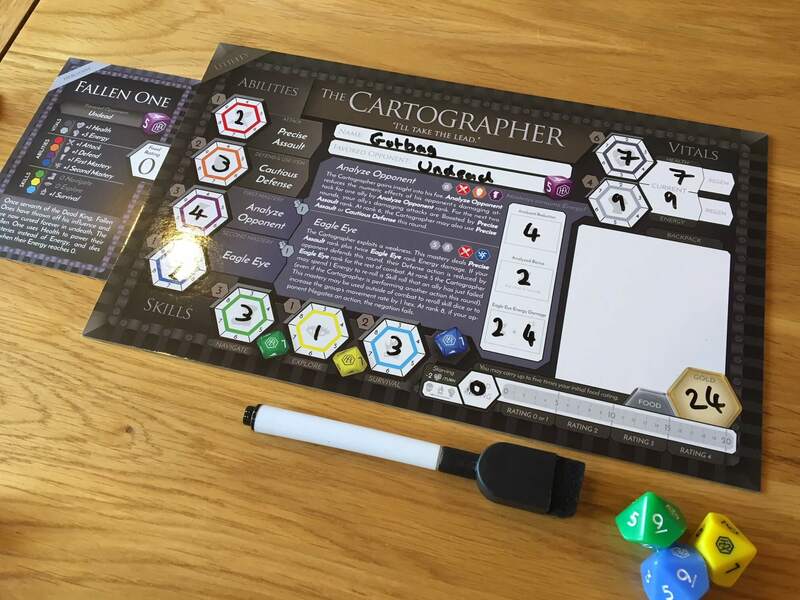 I’ve already discussed a few of my thoughts and feelings about HEXplore It earlier in this review, but to reiterate; this is a game that takes all of the complexity out of boxed roleplaying games, but loses none of the depth – especially in terms of character creation. There are more possible options for different races and classes than I think you’ll ever need. 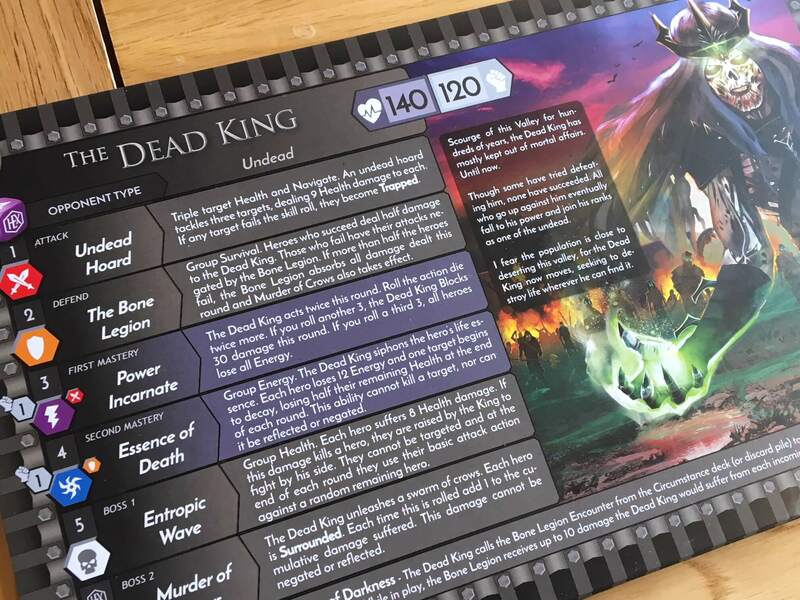 This is partly because whilst the game is highly variable thanks to the card decks and random board layout that it uses, it does centre around the same story (The Dead King) every time. It is a straightforward game to teach and to play, which, thanks to the way characters are created, rapidly draws in new players. I found that very few of my gaming groups were able to resist the allure of creating a character, naming them, upgrading their skills and buying items for them. This level of interaction and engagement commonly resulted in people wanting to play their roles out, but I never felt that anyone felt it was a pressure thing. It came across as fun and jokey from some and more serious from others – in either case, the game was flexible enough to provide a framework to support the group preference. Once play begins, progress is fast and downtime is minimal thanks to simultaneous rolls and skill checks etc. 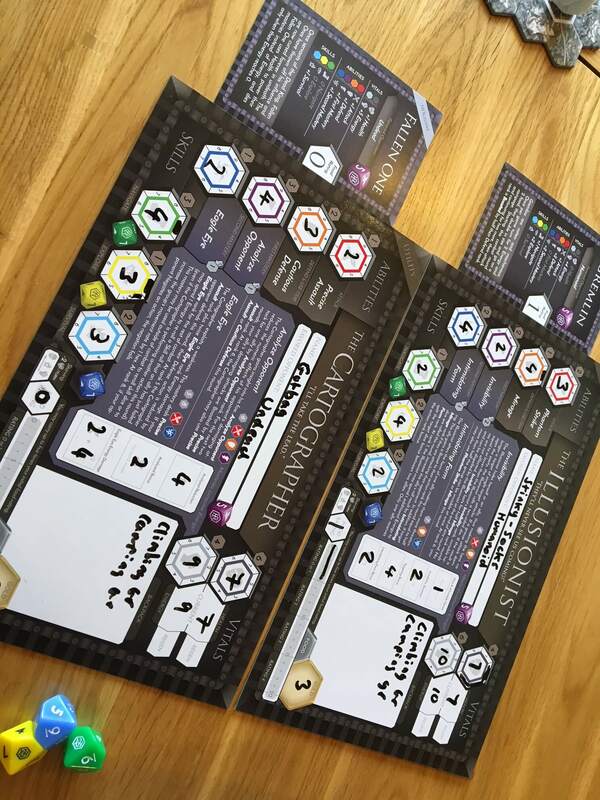 Many of the Quest or Circumstance cards also require players to succeed at the same time, so there is a fair bit of focus on common objectives and outcomes that will generate discussion. Players will need to agree to move the party as a whole (and that might be a problem for some groups) but it’s a feature that I think simplifies game play and keeps it quick and clean. Combat, when it happens, is interesting and challenging, albeit there is a highly random feel to enemy behavior thanks to being dice driven. Encounters are tracked on a separate board that has a number of dials and bits and bobs to support different ways of tracking monster health, damage dealt etc. Success is largely dependent based on how your party has been built – failure to take at least one Striker class character can prove costly, which is exactly what happened to my Illusionist and Cartographer (both Utility class) team. Randomisation plays its part throughout HEXplore It in many ways, both for good (in the deep, interesting decks of cards) and bad (because more or less everything that happens to the players is decided randomly) but on balance I don’t think the game is particularly unfair. As always, if you only roll bad outcomes, you’ll feel like your experience was unfair, whilst if you only roll good ones, your experience might be too easy. 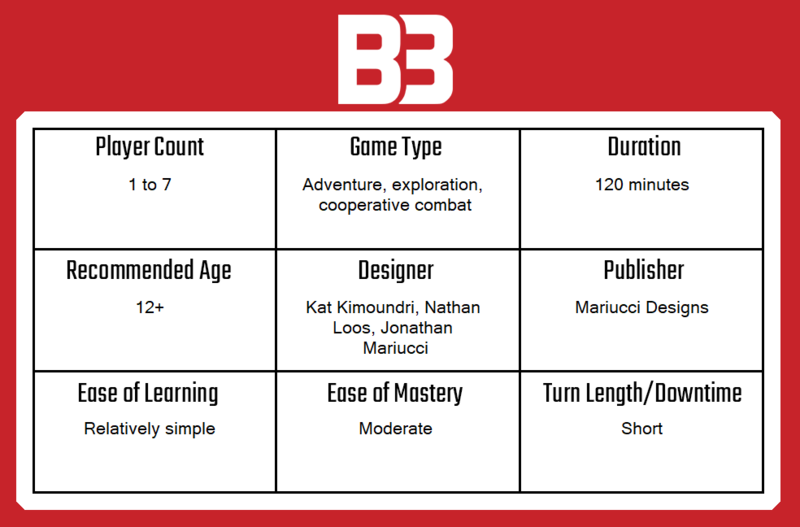 The reality is that over the course of I think every game I played, the result was fairly balanced – but it kind of didn’t matter, because we all made characters and felt that our decisions had counted towards success or failure. From the careful, considerate design to the exceptional component quality and well thought out box, I have been very impressed by HEXplore It. I really like the way in which the game allows players to invest themselves into character creation quickly and simply, whilst also creating a powerful, individual outcome. From there, the game allows players to experience a tight, challenging story that is well paced and filled with decisions and variability. I kind of wish there was another “core story” in the box, but that’s a desire born from how much I enjoy the game and not because it is in any way lacking. In fact, there is already a second game in the pipeline to follow up on The Valley of the Dead King. Frankly, if you have the slightest interest in tabletop role playing, but you don’t know where to begin, then this is a good start. If, on the other hand, this is the kind of game that you dreamed about as a child, then purchasing HEXplore It is an absolute no-brainer. A copy of HEXplore It: The Valley of the Dead King was provided for review purposes. You can find out more about HEXplore It: The Valley of the Dead King on the website of publisher Mariucci Designs.